No way to sugarcoat that. It’s just ugly. BUT, as with all things, there’s always hope. First, though, here’s what’s wrong. There is still a feeling among Bills fans—and apparently among the players, too—that the Buffalo Bills are supposed to lose. In the past, that may have been so, with second-rate players and coaches, and roster depth at next-to-none. Is that really where we are now? What about the offensive line that had the team near or at the league lead in rushing, and essentially allowing zero sacks through one game? What about having the league leader (or near it) in rushing and all-purpose yards last year and this year (before injuries)? (And, they were two different players!) What about Fitz still leading the league in TD passes? Stevie Johnson is the first Bill ever to have two straight 1,000-yard seasons; Kyle Williams, Marcell Dareus, even the somewhat inconspicuous Mario Williams… our whole D-line! Plus Chan Gailey and Dave Wanndstedt are two fairly respectable names around the league on offense and defense. This team does not lack for talent. What they also do not lack is a preponderance for self-doubt, throw-in-the-towel, fatalistic, roll-over-and-die…ness. Chan Gailey mentioned this in the preseason. He saw it in the game against Pittsburgh—you know, the one where the teams play all their starters for most of the game? He said (my paraphrase) that the team gave up too quickly on defense. They had been completely dominant up until allowing Pittsburgh a third-and-very-long conversion from their own goal line. Then they were just in a daze, which the Steelers were happy to take advantage of, marching down the field for a score before half-time. Prior to that, the defense was truly amazing. After that, they were truly horrendous. Somewhere on this team (I’m still hoping it’s not all of the team) there is a good deal of “loser mentality” that accepts (almost welcomes) being run over (literally) by the opponent. Somewhere else, there’s the never-give-up, fight to the finish that we saw last year. But it’s been gone for a while now, and the team’s record shows it. They are 3-10 since last October 30th. 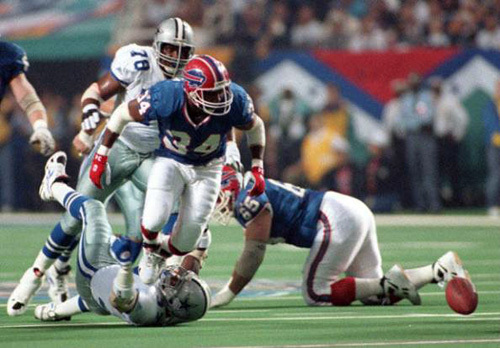 What Bills fan can forget the four straight Super Bowl appearances? We may try, but it’s still enough of an accomplishment that it’s oft-mentioned with pride. There was the heart-breaking wide right of Super Bowl XXV, then the dominant performance by Mark Rypien and the Redskins offense in Super Bowl XXVI, the disastrous blowout in Super Bowl XXVII, followed by the deflating fumble by Thurman Thomas in Super Bowl XXVIII. Do you remember that play? The Bills had a good lead into the third quarter of that game. On an offensive possession in the third quarter, Thomas fumbled the ball away, and the Cowboys scored on the return. After that score, the game was still tied, but that didn’t matter. Somehow (see above) the Bills knew they were going to lose—and they played like it. The Cowboys went on to score a few more times and ended up with an “easy” win, when the reality was, the Bills had been in it, even winning it into the third quarter. I believe that same thing happened in yesterday’s game. The Bills had a good, solid lead into the third quarter. Donald Jones scored on a long TD play from Fitzpatrick to make the score 21-7. 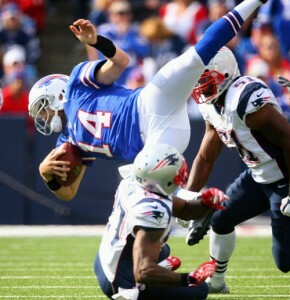 The Bills had held New England in check (well enough that they had only scored 7 points!) and they had been able to move the ball and score. All was well. They moved the ball by running AT WILL. It was bad. Large chunks of yards. It really seemed like the defense was stunned. (See #1 above…) I think they actually were. They were barely moving at the snap of the ball. They seemed shocked that the Patriots—or anybody—could put up yards like that against them on the ground. The Patriots marched down the field and scored their second touchdown of the game, and even though the Bills were still winning, the entire team was completely deflated and had (apparently) already given up the game. Just like in Super Bowl XXVIII. Everyone in Buffalo is questioning Mario Williams. Clearly, the expectations were high (probably too high) when he arrived. He was to be the savior of the team. The next coming of Bruce Smith, forever beloved by all Bills fans everywhere. The craziest part to most of us fans aside from just being unnoticeable is that he also seems to not care. You can’t really know whether or not someone “cares”, but he just doesn’t seem to “go after it” as they say. There’s no energy to his play. And he’s going up against guys he should just completely dominate as a former 1st overall pick (or even just as a 6’6″ 292 lb “freakish” athlete, as some of his teammates have described him). I’m actually (strangely) hoping it’s more due to #s 1 and 2 above. But, when you’re not working to get paid … it’s easy to get a tad (or more than a tad) lazy. What do we say then about these Buffalo Bills? After week one, they were the laughing stock of the NFL. The hapless NY Jets (who have indeed appeared quite hapless since week one) put up 38 points on their newly renovated, brick wall defense. Then a pretty sound thrashing of Kansas City (akin to what NY had done to them one week prior) turned the conversation around—or, at least, confused it—and all was at least OK again in Buffalo. After a comfortable-but-challenging win (on the road) in Cleveland—with zero INTs from Fitzpatrick—things were looking up again, even to the third quarter of the game against New England. 45 second-half points later, and the sky is falling, the season is over, and all the familiar refrains resound throughout Bills-landia. WHEN will it EVER END!? It only ends when this team decides that they can and they will win. Two big (and I do mean “big”) setbacks are the loss of Cordy Glenn and Kraig Urbik will both be out for 2-3 weeks or more. That’s not good news for a line that was looking like it might be the best in the NFL (until yesterday). Add on the upcoming schedule: @ San Francisco, @ Arizona, Tennessee, @ Houston, and @ New England (followed by Miami at home 4 days later)… things do not look well for the Bills. Surprisingly, Ryan Fitzpatrick leads the league—all by himself—with 12 TD passes. (He also has thrown 7 INTs, which also ties him for the league lead, unless Jay Cutler has a bad night tonight… hmm… doesn’t he always?) CJ Spiller doesn’t lead the league anymore, but he’ll be a week healthier next week, as will Fred Jackson. Scott Chandler seems to be a top-tier tight end. We do still have Kyle Williams, Marcell Dareus and the rest of the DL (even if Mario is a no-show). Leodis McKelvin has been pretty impressive when returning kicks (didn’t really get to yesterday). If this humiliating defeat was a good, hard slap to the face for the Bills players (and, if they actually do care about winning) then I expect they’ll have a big turnaround in effort, attitude, and hopefully results this week. San Francisco lost to Minnesota (they did!) but they also shut out the Jets. (In New Jersey, no less!!) So, it’s a tall task, especially if you watched that 45-pt second half unfold. But it’s doable. All depends on how the team responds to what happened yesterday. If Buffalo is cursed, I guess there’s not much we can do. Otherwise, I think they do have the talent they need to have a winning season. They’ll have to win at least one more than they lose the rest of the way to do that. At this point, that feels like wishful thinking. Sunday in San Fransisco, they get a chance to start making it reality.